This is a special memory from my own childhood. Growing up in Michigan in the early fifties meant very poor TV reception. We were 90 miles from Detroit, which at the time was the closest TV stations. We only got three channels — and never all on the same day! We didn’t get to watch a lot of TV but that was mostly because we couldn’t get any reception. I used to hate it when you could hear the show and the screen was nothing but snow or a rolling picture. I used to love it when we could get Saturday morning cartoons to come in! Winky Dink and You was one of my favorite shows! It ran from 1953-1957. 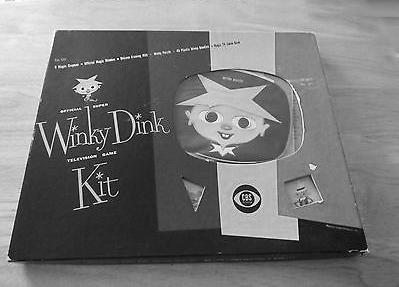 I was probably five when I convinced my mother to mail away and get me the Winky Dink kit. Now if you’re not as old as I am let me explain Winky Dink to you. It was cartoon clips that featured Winky and his dog and at some point, they would need you to connect the dots on the screen to build them a bridge or something to get them out of a dilemma. You needed the special green Winky Dink screen to put on your TV so that you could use the special Winky Dink marker to connect the dots! I wanted so bad to connect those dots and I must have begged forever to get her to order it. You couldn’t buy the kit at the store or at least you couldn’t buy it at any of the stores in our itsy bitsy town. The minute she mailed the order, I got a dining room chair and sat down in the kitchen in front of the clock. At five years old, I don’t even know if I knew how to tell time but I can see that big clock on the wall over the green kitchen sink. It had a second hand and I was watching it go around when my mother asked me what I was doing. Don’t know why it wasn’t obvious. I was waiting for the 6 weeks to go by and my Winky Dink kit to arrive! The absolute worst part of this story is that it never came. Looking back, I wonder if she even ordered it! This memory was posted in Memories FOR Amara and tagged Kc the child, Winky Dink on July 18, 2014 by Grandma Kc. I have never heard of Winky Dink, but my heart breaks for you. I can only imagine how you must have felt at 5 waiting and waiting for something and it never arrives, but makes the story even sadder, your mother allowing you to wait and wait knowing that she never ordered it. What a childhood memory. Rhonda, I told you that if a license was required to become a parent my mother would have never passed the test! Everyone should ready your post Parenting 101 Please! I remember those days of wanting things… when I could get them… I realized how unimportant they were… I didn’t know that as a child though…. Knowing my mother she probably told me she ordered it so that I would stop asking and then she could just blame everyone else when it didn’t show up. She would never have won the Mother of the Year award. The test pattern! I can remember starring at that on Saturday mornings waiting for the programming to start! Things were different then! Did you use to watch the Mickey Mouse Club show? I would race home from school praying we could get reception! Knowing my mother she probably really didn’t order it. She really just wasn’t the best mom but Dad sure tried to make up for it! Isn’t it so wild how far television has come. I remember those fuzzy pictures. I was nearly a teen before we got a fourth station. I recall an advertisement for one hundred dolls, which I saved and ordered. It took forever. Tiny flat plastic, not at all what they were made out to be. Pretty major stuff when you’re a kid. I remember thinking that when I had a job, I would buy tons of cereal so I could have all the prizes. Oh my. Back then the prizes in the cereal were so much cooler, too! Or was it just that I was so young and remember it that way? I used to love Cracker Jack for the prizes, too! Oh my goodness! I DO remember Winky Dink! But what is weird is that I think we may have had the screen, but I don’t recall any satisfaction from it working. Or maybe I was frustrated because we didn’t have it and I was dying to know what was being shown. Hmmmm! I remember ads on the back pages of comic books – one was for a little monkey (live) that fit inside a teacup. I sooo wanted him! I cannot imagine what or how this was sent out and how it could have been humane. And I also remember seeing the “100 dolls” ad that the previous comment mentioned. Along with Judy, I watched Sky King on Saturday mornings, and the guy sponsored by Ovaltine! Just can’t think of his name! Kc, I just LOVE these memories of yours! I don’t remember the tea cup monkeys but I do remember the dolls and you could send away for sea horses, too! Don’t think we ever did! I saw Ovaltine in the grocery store yesterday and smiled and thought of you! I have never heard of winky dink either…I hate when I am not in the know…LOL! This is a great heart felt story…thanks for sharing. Laurie, you are probably much too young to remember Winky Dink! Bill Gates referred to it as one of the original interactive shows! I never really got to find out. Awwww .. that must have been torture for you waiting for your Winky Dink kit to be delivered. I can see you sitting there watching the clock and waiting … so precious. I wish they would have arrived. They had such fun and I have to admit it has me wanting to take a Wilton class again. I’ve forgot as much as I ever learned. Maybe I can get Jenna to do it with me after the kids go back to school! When you have free time you must find me a picture of your wedding cake that Mom made you. I want to show it to Amara and I can’t find any of those pictures. She’s heard stories of her Mommy sitting in the high chair begging for frosting while Mom decorated your cake. She needs to see it! I remember ordering dolls from (maybe?) cereal boxes! There are so many stories behind that sink I should give it its own post!